Neuroimaging shows that marijuana users have low blood flow to the brain. Marijuana is a psychoactive sedative drug and is derived from the hemp plant, Cannabis sativa. Its leaves and buds can be smoked, taken in food, brewed in tea or taken in concentrated liquid form. As the U.S. races to legalize marijuana for medicinal and recreational use, researchers are concerned about the drug’s long-term effects on mental function and emotional health. Now, a study from researchers at the University of California San Francisco shows abnormally low blood flow in the brain in nearly 1,000 marijuana users compared to healthy controls. The team state that their findings, using neuroimaging, include areas known to be affected by Alzheimer’s pathology such as the hippocampus. The study is published in the Journal of Alzheimer’s Disease. Previous studies show that marijuana exposure can cause long-term or possibly permanent adverse changes in the brain. However, few studies have evaluated the impact of marijuana use on regional cerebral blood flow. The current study investigates whether perfusion in specific brain regions using functional neuroimaging, including those affected by Alzheimer’s disease pathology, are abnormal in marijuana users compared to controls. The current study uses single photon emission computed tomography (SPECT) to evaluate blood flow and activity patterns in 982 current or former marijuana users. Participants had brain SPECT at rest and during a mental concentration task compared to almost 100 healthy controls. Results show that low blood flow discerned by SPECT in the hippocampus in marijuana users reliably distinguished them from controls. Data findings show that the right hippocampus during a concentration task was the single most predictive region in distinguishing marijuana users from their normal counterparts. The lab note that marijuana use is thought to interfere with memory formation by inhibiting activity in this part of the brain. Results show the global reduction in blood flow in the marijuana users brains, and that the hippocampus was the most affected region due to its role in memory and Alzheimer’s disease. The team state that their research has proven that marijuana users have lower cerebral blood flow than non-users. Data findings show that the most predictive region separating these two groups is low blood flow in the hippocampus on concentration brain SPECT imaging. The team surmise their work suggests that marijuana use has damaging influences in the brain, particularly regions important in memory & learning, and known to be affected by Alzheimer’s. They go on to add that the media has given the general impression that marijuana is a safe recreational drug, and that this research directly challenges that notion. For the future, the researchers state that the open use of marijuana, through legalization, will reveal a wide range of marijuana’s benefits, as well as threats to human health. 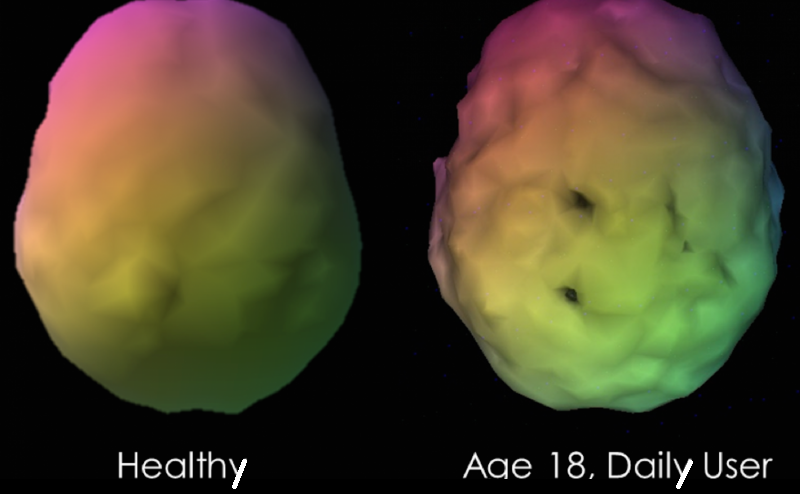 This shows a sample case of a visual 3-D rendering of a baseline SPECT scan of a longstanding marijuana user compared to a control subject. The marijuana user has multiple perfusion defects with lower perfusion shown as scalloping and gaps in perfusion of the temporal and parietal areas. Credit: IOS Press. Kirkwood A Pritchard Jr., Ph.D.
Would the same be true for a person who smokes cigarettes?